Walk on walk off syndicate currently operating from The Spit now has a resale share available. Since its launch, the Targa 38 has been one of the fastest selling models in the Fairline range. 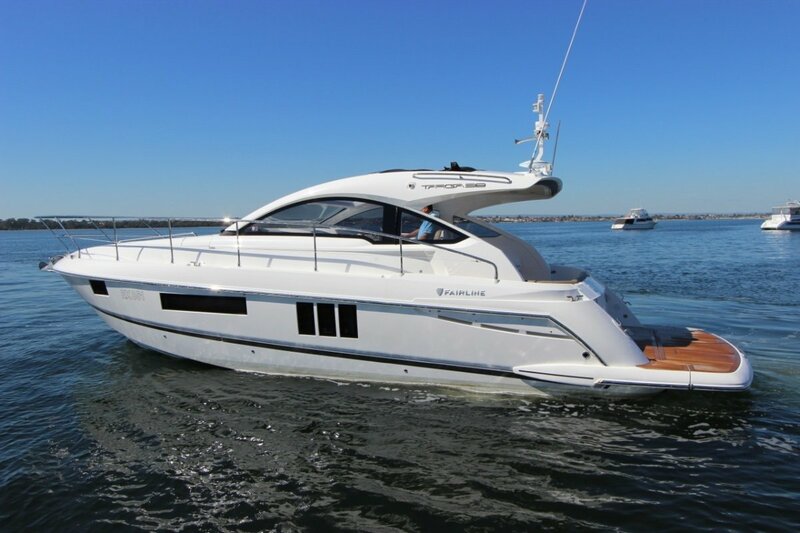 Sleek and powerful, this is a truly infectious sports cruiser that handles beautifully. The swept-back radar arch and flowing lines of the hull and superstructure hint at the true personality of this 38-footer, where power and beauty are delivered in one well-considered package. The 360° panoramic view from the saloon and the striking vertical hull windows that let light pour in also suggest that this compact Targa believes itself to be a much larger boat. This particular vessel has been optioned with the expansive submersible swim platform. Ideally suited for Sydney Harbour day cruising. Call Chris Lynch on 0434 491 85 9 for more details. For more information on this vessel please call Chris Lynch on 0434 491 859. At One Brokerage we pride ourselves on personalised service. Whether you are looking for a new boat, pre-owned boat or a boat share we can help. We are dealers for Fairline Yachts, Regulator Marine, Horizon Yachts and Boat Equity. With offices in Perth and Sydney we can cover an Australia wide market. Our services include brokerage, syndicate management, berthing, insurance and maintenance.